For several years I have been intrigued by this building and wanted to know more. Over the summer I did some research on the building and although information was in short supply did manage to find out more about when and why the it was erected. In the 19th century, mass education was hotly debated nationally and locally. Funded by a combination of charitable subscriptions and governmental grants, school buildings sprang up all over the county. By 1857 the government were alarmed to note that the Education Grant had increased to about half a million. By comparison the Crimean war had cost about £70 million and the Royal Stables were granted tens of thousands of pounds. A review was set up to find a cheaper way of delivering mass education. 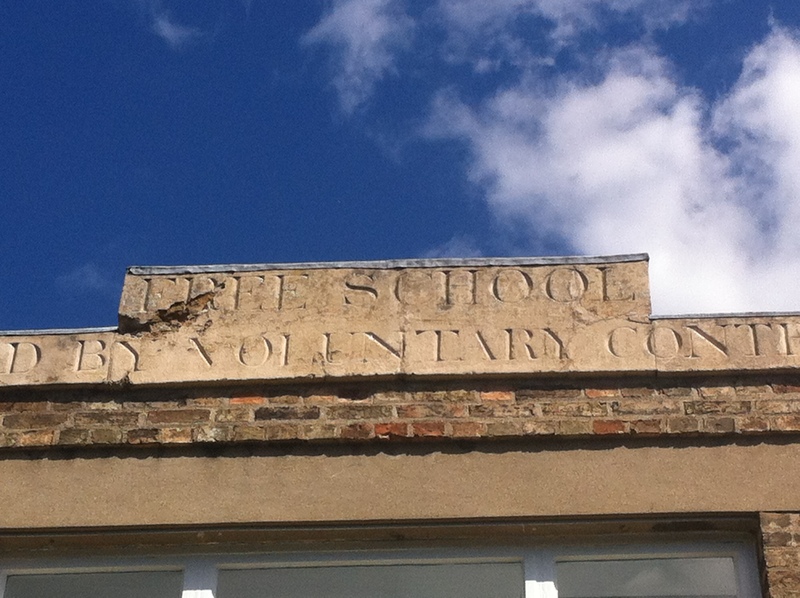 Looking at the Castle Hill area in Cambridge, Boy’s School, the building of which survives today, was built on Pound Hill in 1812. This started life in the Friends Meeting House in Jesus Lane in 1808. Known at St Peter’s, Castle End, then Pound Hill Boy’s School and later St. Giles and St Peter’s Junior Mixed School, it closed in 1924 with pupils moving to St Luke’s. Enid Porter said ‘Castle Hill was popularly known as The Borough – the burgh or fortified place – and anyone born within its boundaries was called a ‘Borough Boy’ (until 1912 a public house of that name stood at 19 Northampton Street). 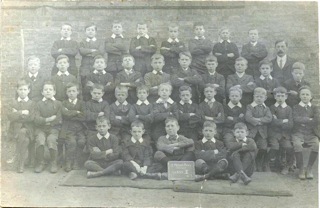 St. Giles’ Infants school opened in Albion Row in 1826, closing in 1938. Children were admitted to the Infants school at 2 years old, child care being very useful for working parents with large families, moving to the boys or girls school at 6 years. To gain admittance children had to be accompanied by a parent or guardian and have an admission paper issued by a ‘subscriber’ or Clergyman of the Parish of St Peter or St Giles. Children were required to come to school clean and neat. We do know that ‘subscribers’ to the schools’ insisted that all pupils attend Church on Sunday. Scripture and the learning of the Catechism formed a prominent part of the curriculum. St. Giles’ Girls School opened on Pound Hill, opposite the Boy’s School, in1845 and closed in 1930. The Log Books are not very helpful about the school days of the children of Castle End but are pretty revealing of the life of the area. They are most particular in listing punishments (generally for lateness and unauthorised absence) and those reasons for absence. Exclusion from school was a regular form of punishment. Castle End was a close-knit community. Its mainly working class residents crowded into insanitary houses in airless courts and yards. Infectious diseases could spread easily in the closely packed housing in St Giles and St Peter’s. Measles, scarlet fever even smallpox caused children to be absent or parents kept children at home for fear of catching anything. Attendance was also affected by the weather. Wet boots dried rock hard in front of the fire overnight. When children tried to pull them on over chilblains caused by the cold, the pain was exquisite. Many poor families did not have enough boots for all the children at the same time. No good excuse in the school teachers’ eyes. A very common cause of regular absence was due to children helping out at home. At the girl’s school, numbers reduced every Friday afternoon and Monday morning as children of local laundresses helped fetch and carry linen from the Colleges. Children would not return promptly after the summer break as they were helping with the harvest. Children would help fetch and carry food or drink to parents working in the fields or even assist with gleaning and caring for smaller siblings whilst parents worked. As Castle End was on the rural outskirts of the town there is mention of trips to Madingley Woods to gather bluebells and half days picking blackberries. Children are also noted to ‘absent’ themselves to attend other local events such as the Volunteers’ Review (troops passing through Cambridge), fireworks on 5 November and parades. However, Sunday School treats were a regular feature of the year with tea and games being organised in nearby fields such as those of Mount Pleasant and at Trinity College Cricket ground. The poverty of the 19th century Castle Hill area seems in stark contrast to today. Boasting several fine dining establishments and two nationally renowned museums the area has lost its densely populated and insanitary yards. Yet this is the area where Cambridge began – bridging the town and the countryside and playing host to a Roman fort and a medieval Castle. Those ill shod children whose parents were scrapping a living could never have imagined that two centuries later Kettles Yard would be an internationally renowned modern art Centre and the old White Swan Inn a museum telling the social history of Cambridge. Although if they were to sit, once again, on the seats in the ‘old bar’ of the Folk Museum they might just be able to conjure up memories of story telling on cold winter nights as they warmed their feet by the large open fire. Donkey Common or Donkey Green?